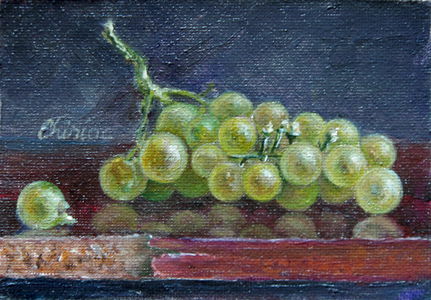 I’ve started to paint some fine art oil paintings ACEO :still life fruit. Well, I’ve finished a still life painting in the realism style of a pear but, unfortunately, I didn’t take a picture of it, yet. 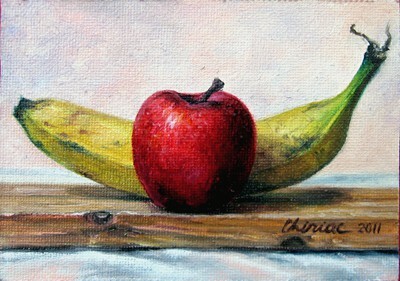 ← I’m the WINNER of the Artjudge.com “Oil painters” contest! I have always been interested in glazing techniques. I have it down with acrylic and watercolor but oil seems to stump me! Do you use a quick dry medium to be able to go over your colors so quickly? I just end up with muddying my colors and over working them! Any advice would be great! Thanks! Painting in oils is very different than using acrylics. One difference is the drying speed. You’re right, I use a “quick dry” medium. Only that it’s not really drying but gives some thickness. Search for thixotropic propriety . “Flemish medium” is such a thixotropic medium and fits very very well to glazing technique. Another thixotropic medium is Venetian medium only that it contents bee wax so that is better for “alla prima” technique. Anyway, even using those mediums you still have to wait for “drying” before applying a glaze. Well, it’s a pain slow technique. Thank you! Sorry it took me so long to get back to you! I appreciate the feedback! !